Stephanie, an Associate with Calcagni & Kanefsky, focuses her practice on criminal defense, internal investigations, and litigation. Before joining Calcagni & Kanefsky, Stephanie served as a judicial clerk to the Honorable Walter F. Timpone of the Supreme Court of New Jersey. While working with Justice Timpone, Stephanie drafted legal opinions on a wide range of issues, including state criminal matters. 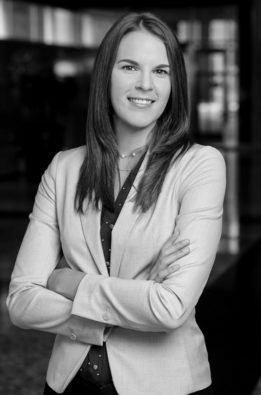 Stephanie began her legal career as both a Summer Associate and Legal Intern with Calcagni & Kanefsky, working on a federal anti-kickback trial among other white collar criminal matters. Representing charitable organizations and super PACs in separate investigations by the New Jersey Attorney General’s Office and U.S. Attorney’s Office regarding compliance with state and federal registration and reporting requirements. Representing funding institution in contractual dispute in pursuit of nearly one million dollars in factoring debt. Stephanie was awarded the Presidential Scholarship while studying at Seton Hall Law School. She was also the recipient of the “Best Argument” Award for Appellate Advocacy during her second year and the Equal Justice Clinic Award at the Center for Social Justice at Seton Hall Law during her third year. Prior to law school, Stephanie served as an AmeriCorps volunteer with Peace First, teaching social-emotional learning skills to children from second to eighth grade in an underprivileged school in Brooklyn, NY.